It’s already mid-May here in Southern Ontario and the trees are only just beginning to bud. Without the canopy of leaves overhead there is plenty of light reaching the forest floor. Just as the early bird gets the worm, there are a few opportunistic plants taking advantage of this early light by being the first to arrive. These plants pop up and flower very early in the season and by the time the leaves appear in the trees over head, they are gone. Of course I am generally only concerned with the ones that I can eat. In my area around Toronto, the Trout Lily seems perfect for picking around the end of the first week of May, but this will of course vary with the weather. Personally, my foraging of this plant is generally limited to eating a few out of hand when I’m hiking. 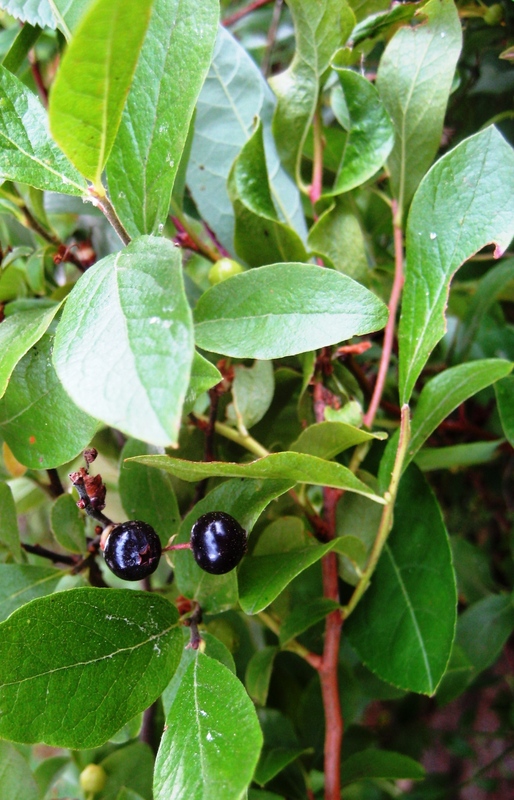 The leaves are soft, moist, have a very nice delicate and somewhat sweet flavour. They are also easy to identify as there isn’t much else around. The smooth, toothless leaves are light green, mottled with some dark green, almost brown areas, when they are perfect to pick. As they mature they become a solid light green and will begin to lose flavour. Their bell-like yellow flowers also help make them easy to identify. It is generally recommended that you cook the leaves and many authors warn of their emetic effects, that is, they could cause you to vomit. I have never eaten enough of them to find out if that is true. You can also go a step further and dig up its roots to find a very small bulb-like corm. These should be boiled for 20 or more minutes and served with butter. The corms are relatively deep in the soil for a plant of this size and are delicate enough that you can’t just partially dig and pull or you will lose them. You will have to dig deep enough to loosen the corm if you want to be putting a few in your dinner pot. High Falls is my favorite place to camp. 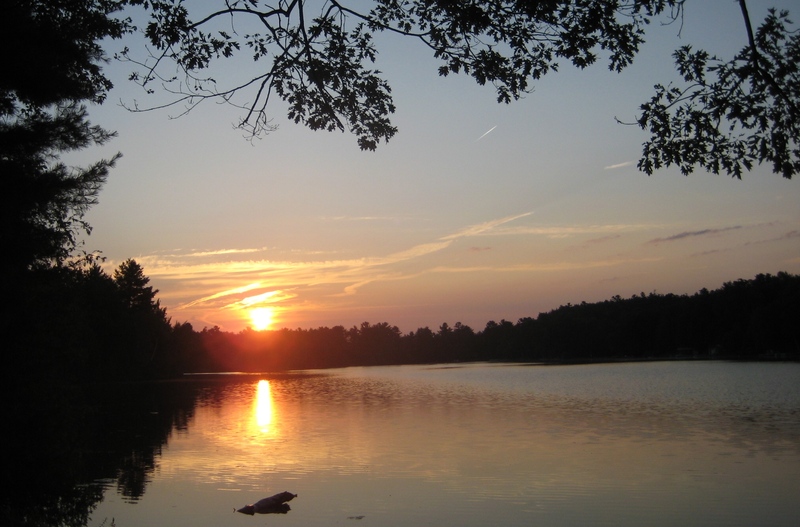 Why go all the way to Algonquin when beautiful places like this exist all over southern Ontario. 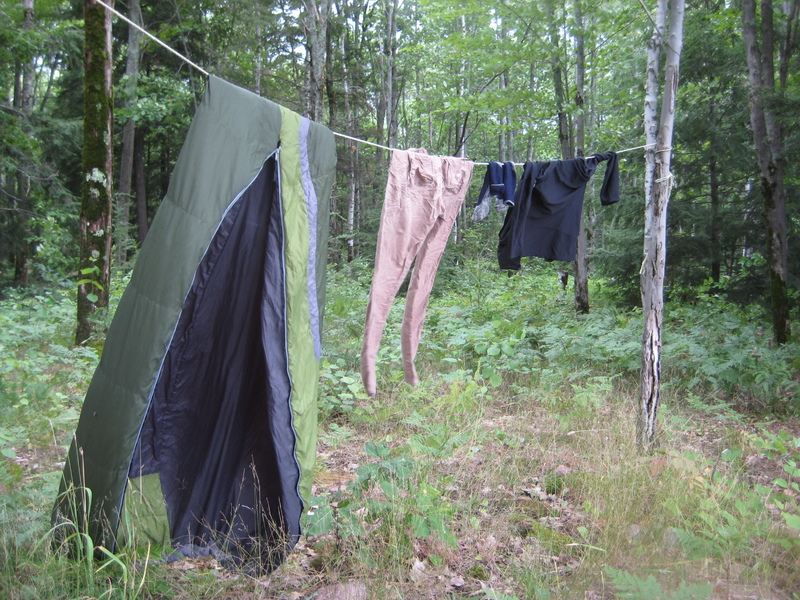 Over the last 20 or so years I’ve camped there on Crown Land countless times in nearly every month of the year (having somehow missed November and May). If you read any of Kevin Callan’s canoe route books you may have come across his entry for High Falls. 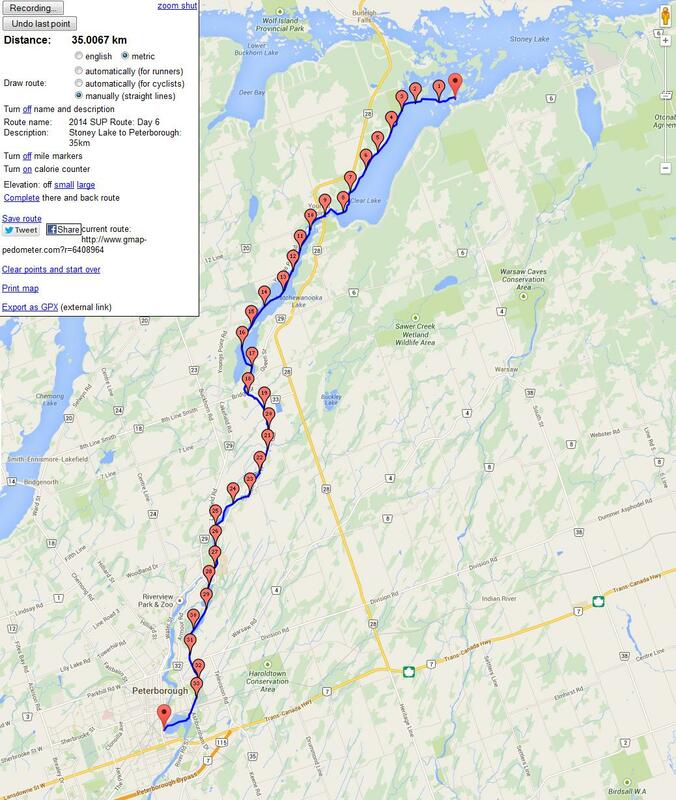 A popular route is to put in at Haultain at #28 and paddle downstream to the falls, and then onto Northey’s Bay road. Or to do an up and back from Northey’s Bay Rd. These routes are popular because they are are relatively quick. If you don’t feel like staying the night you can get up there from Northey’s Bay Rd in less than an hour, stay for lunch and be home in time to make dinner. Who would want to make this a 100+km trip? To make things more interesting I decided a Stand-up Paddle Board would be best. Kelly over at Peterborough SUP seems to be the only one around offering proper touring (displacement hull) SUPs for rent and from his store on George St you can carry your SUP to the water to begin your journey from Millenium Park. 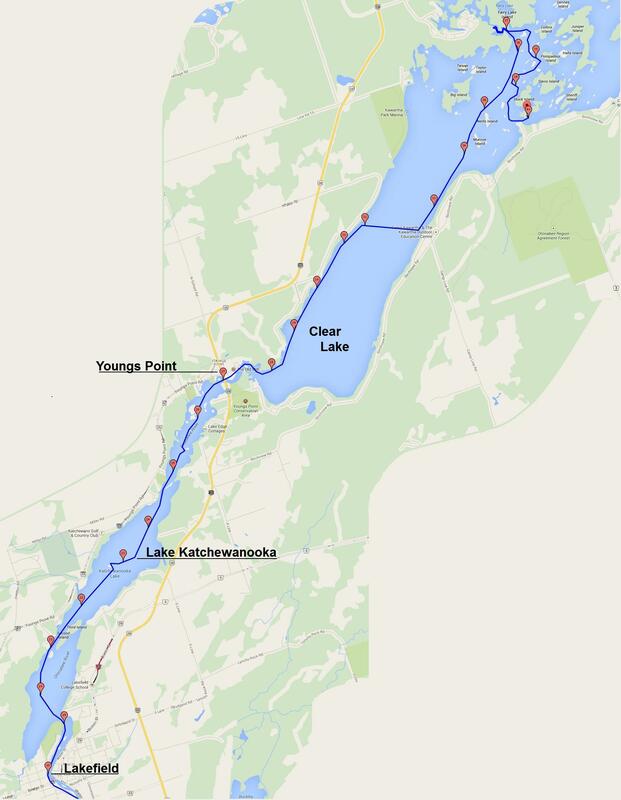 Starting with Lock 20, just a few minutes into your trip, there are 8 locks along the way, which, if you’re on a SUP, means 8 portages, that is until Parks Canada’s Health and Safety Committee reverses their decision to ban us from the locks. 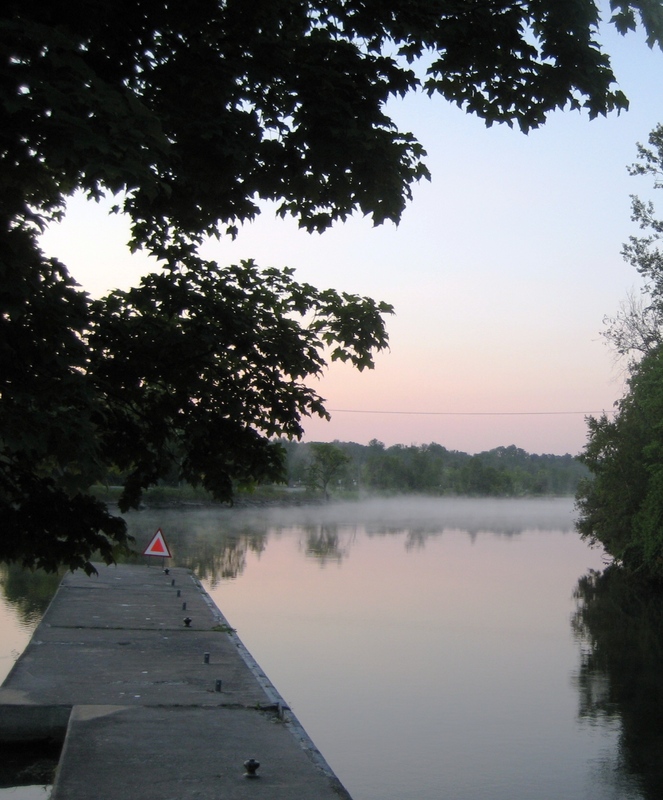 Canoeist/Kayakers can purchase a lock pass. 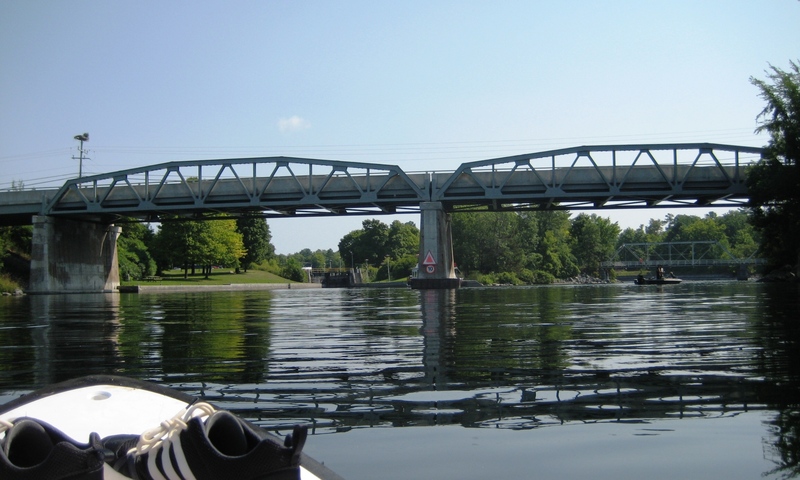 The biggest portage is past the Peterborough Liftlock. It does offer a commanding view of the surrounding area, but getting your stuff up there will slow you down. 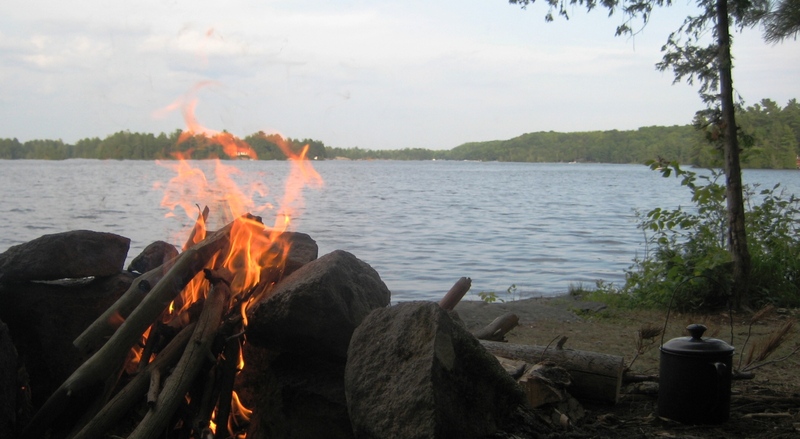 The number of nights you decide to camp along the way is obviously completely up to you but there are quite a number of considerations to your stops in this urban/rural/wilderness kind of trip. If, for example, you only want to do 10km one day and that lands you right in the middle of a string of cottages, you have no place to stay, so you do have to plan accordingly. Lock side camping is available through Parks Canada for the incredible bargain of just $4.90/night! Expect to pay quite a bit more if you want to stay in comfort on your 1st night at Lock 24 (Douro) where they offer 3 small cabins that they call “oTENTik“. Be sure to book well in advance for one of those! 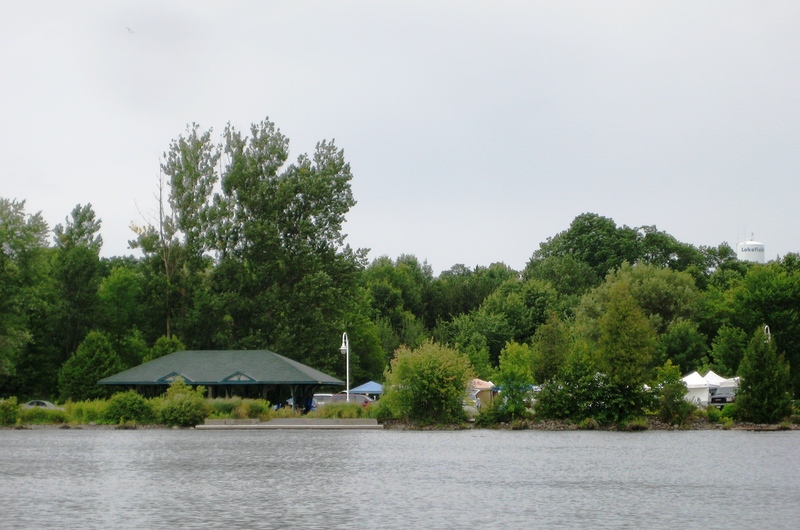 From Lock 24 you’re 14km into your trip and just 4km to Lakefield’s Lock 26, where you can buy the rest of your groceries, as Foodland is a short walk from Lock 26 and open 24hrs. My plan was to make it to Young’s Point for my 1st night. I made it to Lakefield by 430pm and went for dinner at a local restaurant before provisioning up at Foodland. Young’s Point is, for me, another 2hrs upstream. I figured I could make it there before sunset, but I’d never get there before they closed. From Lock 26 I paid in advance for a camping permit for Young’s Point and the lock operator even had a washroom key for me that someone had dropped off on their journey south, having forgotten to hand it in at #27 when they left. I arrived in Young’s Point late on a Monday night, approx 28km already behind me and the sun well hidden behind the trees along the western shore of Lake Katchewanooka. Arriving exhausted, but having eaten 2hrs prior, I simply set up for the night, went for a swim after sunset and was asleep at a reasonable hour. I would recommend swimming with water shoes. These waters are now infested with Zebra mussels and they are razor sharp! Never thought much of them until I sliced my foot here two years ago on another trip. There were just 2 boats moored for the night and no campers. It felt like I had the place to myself. I camped close to the dam so that white noise would cover any sounds from Highway 28, just a few hundred meters to the south. If you stayed at Lock 24 on night #1 then this could easily be the 2nd stop of your trip. 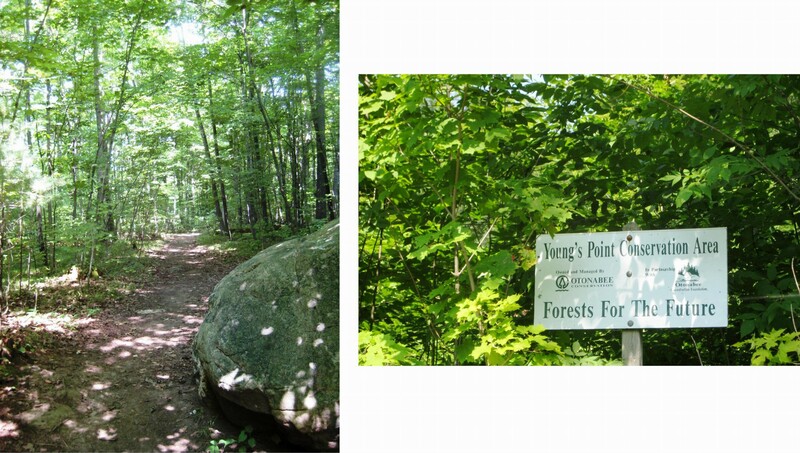 While you’re at Young’s Point, be sure to check out Lockside Trading, the local General Store for any other provisions you may still require, Young’s Point diner for a nice breakfast (formerly Granny’s Restaurant) and take a stroll through the Conservation Area on the other side of the dam. 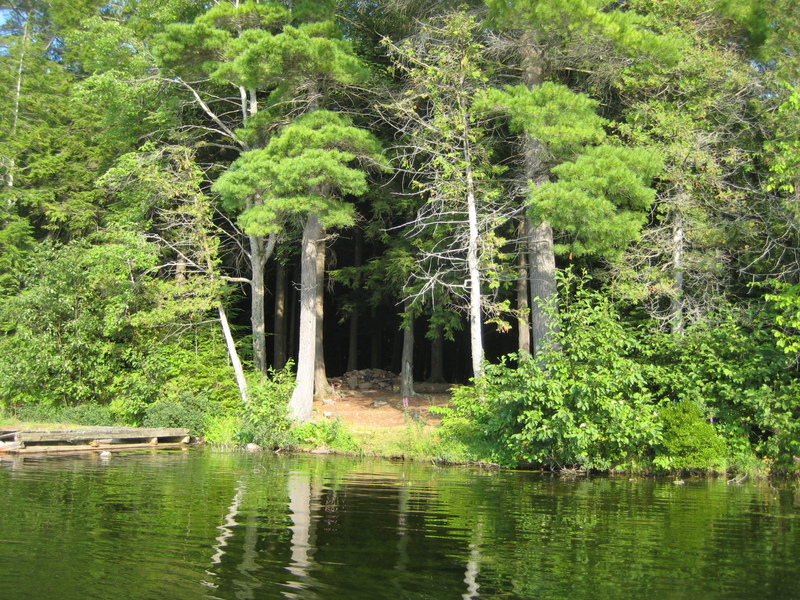 When you set off again you’ll be heading north into Clear Lake, where you have about 9km to cover before you enter Stoney (often spelled Stony) Lake and the land begins to transition to the Canadian Shield. Stoney is dotted with islands, most of which will have cottages on them, but some of the smaller ones may offer you a place to rest/lunch along the way. I had an incredibly strong tailwind on this leg of my journey. The waves rising to 1.5ft or more in the middle of the lake. I eventually took refuge on the leeward side of a small island, maybe 20ft across. I noticed a strong smell of onions from it as I passed. I climbed ashore to stretch my legs and sure enough, much of it was covered in a kind of wild chive (and quite a few Closed Gentian, the purple/blue flowers below). Things get rockier as you get further east towards Upper Stoney. It will add a few extra kms to your trip, but if you have time, swing by Doe Island. It is a small island rising about 3 stories out of the water, offering a great place to stretch your legs, go for a swim, get a bit of shade and a get great view of the surrounding area. Okay, time to get to High Falls. Eels Creek spills into Upper Stoney rather undramatically. Even the dog in the background seems uninterested (photo on the right), but there it is, that’s what you’re looking for. 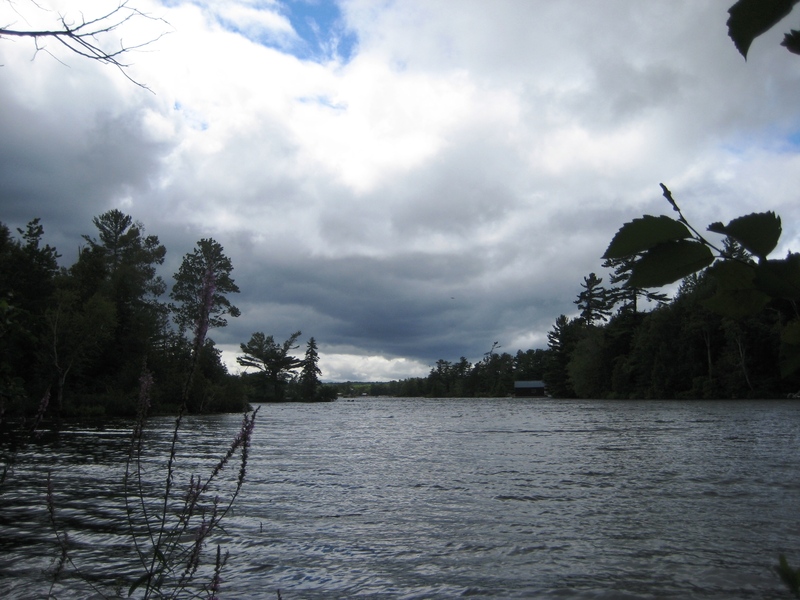 A local cottager pointed the way for me when I didn’t feel like pulling out my charts to find the correct channel from Stoney. You’re on the home stretch, just 1 more hour and a few portages to go. For reference, that bridge in the photo below is Northey’s Bay road. Both sides of the portage on this side of the bridge are private land, so no camping until you cross the road into Crown Land, even then there are a few restrictions posted. And there’s High Falls. 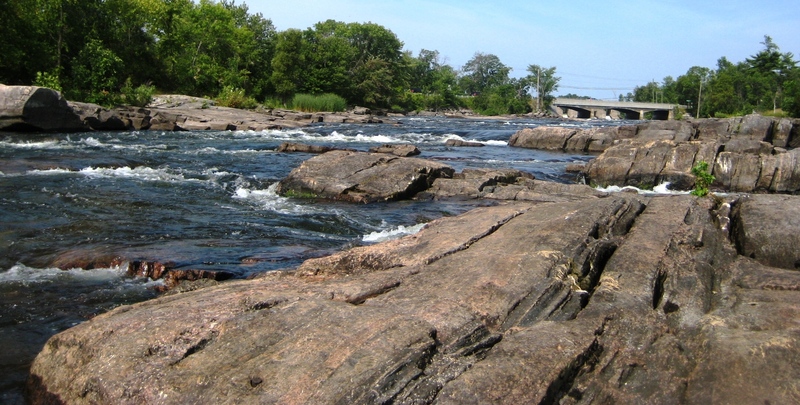 A set of rapids really, but a nice focal point for your camping trip. I chose a spot to camp downstream from the Falls on a small kettle lake with easy water access, and a nice patch of sweetfern. I spent only 1 night at High Falls. The threat of thunderstorms pushed me to get at least a little closer to home. 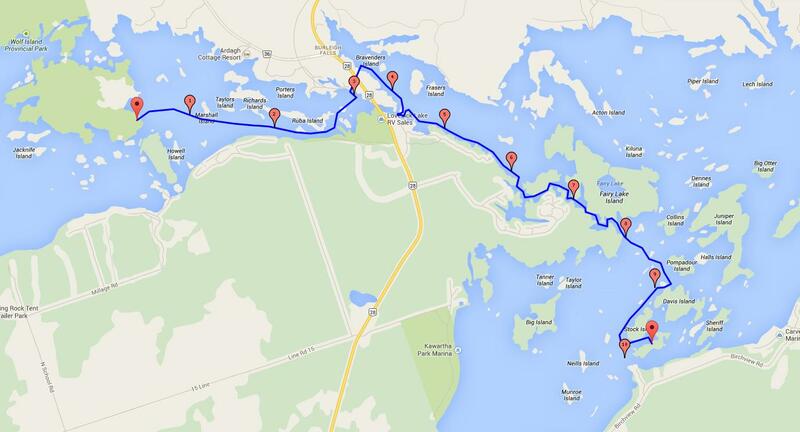 So, for day 3 I paddled about 20km, taking the long way to an island site on Stoney Lake to camp, passing St Peter’s on the Rock on my way. I’d camped on this island before but my island site now had a dock! It was a bit rotten, but still floated (mostly). Not sure how it got there, but it did make unloading gear a bit easier, offered a nice spot for my morning coffee and even had a solar powered light at the end of it that still worked! 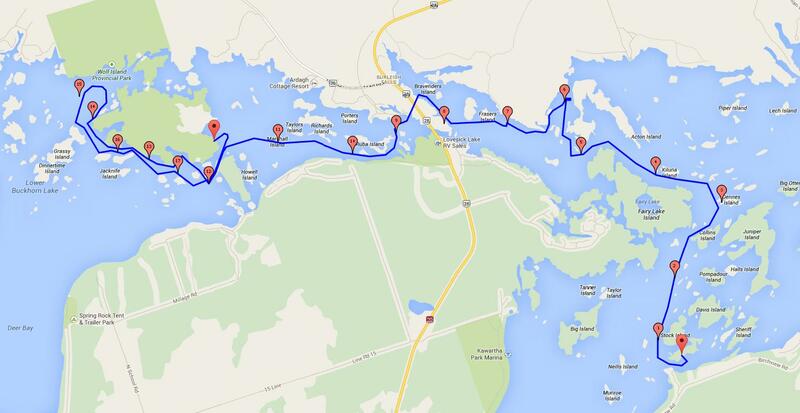 … and from there, on day 4, I paddled all the way back into Peterborough. It was 35km and while I had planned to break it up with another night of camping, I was just cruising along, making good time and the closer I got the less sense it made to spend another night on the water. I’d love to hear from you if you give it a go. If you’re trying to maintain your cycling fitness over the winter and it’s too cold to venture outside then you need to get creative with your workouts! If you’re not able to get to a cycling studio that offers watts based training then get a power meter, setup your bike at home and start pedaling until the snow melts. This year I discovered Golden Cheetah, the power analysis software, and it has helped make my indoor workouts much more fun interesting and productive. You can ride somewhere different every week. Last week I rode with Team SKY in Mallorca, did a group ride in Germany and rode a section from a the 2014 Tour de France. The best part of Golden Cheetah is the post ride analysis. Compare intervals within a ride or from one ride to another. 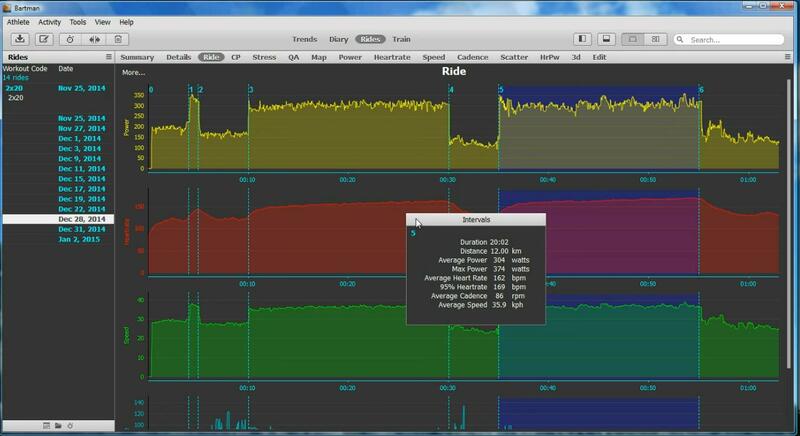 Have a look at cadence, HR, power, speed and how one affects the other. 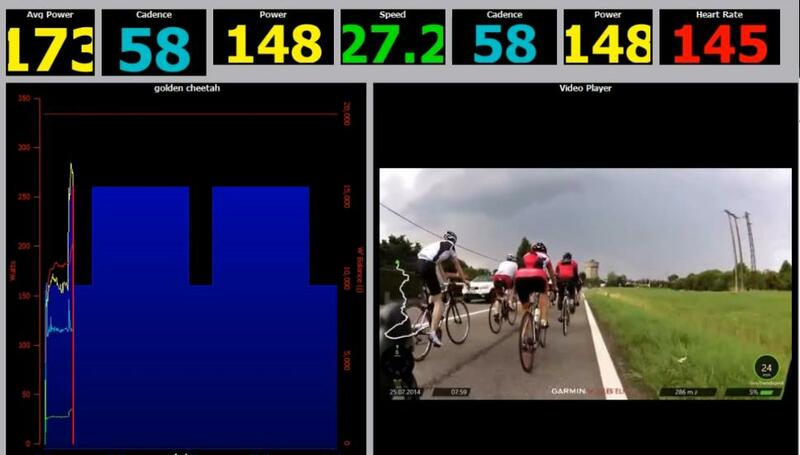 Below, in the Ride Summary window, I highlight my 2nd 20min interval to see all of the relevant metrics at a glance: Duration, Avg Power, Avg Heart Rate, Avg Cadence etc. “What the heck is ANT+ USB stick and how will it help with my indoor bike training?”. Great questions, I’m glad I asked. Like Bluetooth, ANT+ is a wireless protocol to allow connected devices to communicate. It’s very much the standard for fitness devices, especially in cycling. It allows various brands of devices to work together so that, for example, you can wirelessly connect your Powertap hub to your Garmin Edge 510 bike computer. An ANT+ USB stick will allow communication between your various sensors and your home computer. For my indoor training this year I wanted to display data from my bike sensors onto my laptop in real-time. If you want to go with TrainerRoad or similar training software, and it’s not running through an iPhone app, then this is one way to do it. 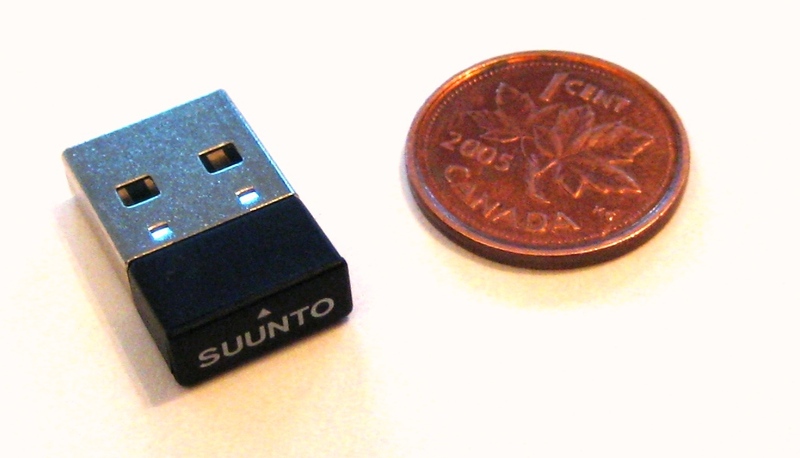 Suunto makes the cheapest ANT+ USB stick that I could find – The Suunto Movestick Mini, priced at just over $40CAN. 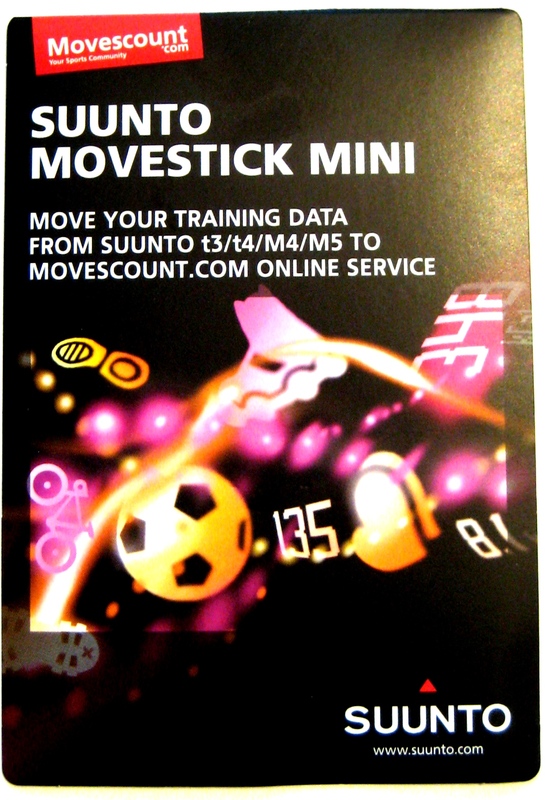 Suunto markets this device as a way to upload your data from various Suunto watches to their on-line training software at Movescount.com. They don’t even have the ANT+ logo on the packaging, so you’d have to look at their website for even a hint that this is in fact an ANT+ device. So despite the many assurances from my otherwise trusty retailer that this would not work with my bike sensors, I picked up the Movestick Mini and headed home to give it a try. The first thing you’ll notice is how tiny this thing is! The 2nd thing, is how easy it is to setup. Plug it in as you would a flash drive and it is auto-detected immediately. Windows will then auto-load the device drivers and it is good to go! Now you’ll want some training software. I went with the free Golden Cheetah v3.1 training software. Its setup wizard gets your device(s) paired with ease. For now it’s just pairing with my Powertap SL+ hub and my Bontrager Heart rate monitor, but will pick up any ANT+ device. According to DCRainmaker, this USB stick has 8 channels, so you should be able to pick up every sensor that you need. So, during my indoor rides (on my Kurt Kinetic Road Machine), Golden Cheetah now displays my speed, cadence, heart rate and power data, saves my workouts and offers a dizzying number of power data analysis tools. …but more on Golden Cheetah in another post. I’m up at 7 and begin to shiver as soon as I undo my sleeping bag. I debate making some breakfast and coffee but decide to just get moving. I pack up, put on every layer I’ve got and am underway by 8am. I kneel down for the the first 30min until I am nearly across to the west side of Clear Lake and at least partially sheltered from the wind. Then, finally back on my feet, I enjoy the scenery as the next 90min takes me at last into Young’s Point. Back to Granny’s Restaurant for breakfast which leaves me too full to paddle as a light rain blows in. It’s a slow day at the lock so the lock operators offer their hospitality and a spare chair in their office to pass the time and wait out this round of showers. 1pm, seems like the clouds will never break, but it’s time to start moving again. A light drizzle continues and I set off into a light headwind towards Lakefield. On this wet, cold, windy and cloudy day I didn’t really feel like a whole lot of sight seeing but I did feel compelled to snap a few photos on the way into town. 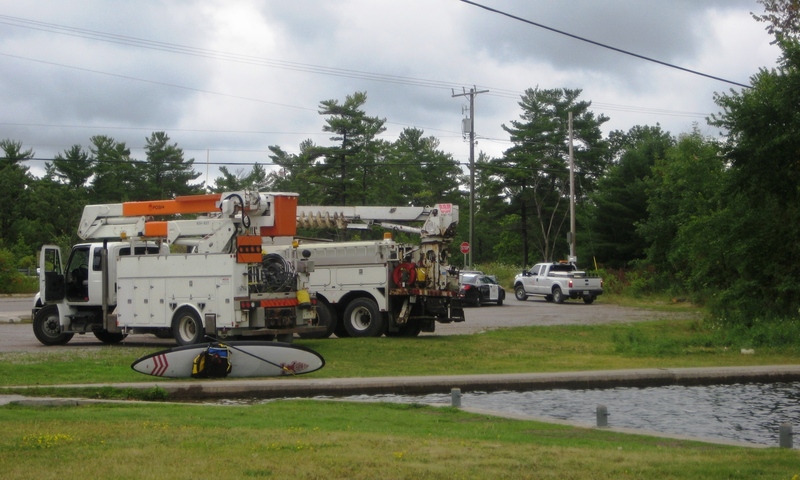 On a nicer day you might even want to stop at this picnic area on the side of the Otonabee. Perhaps on the way up next time? Kneeling through the worst sections of wind I make good time, arriving at Lock 26 90min after leaving Young’s Point. Should I stay the night, I wondered as I finished another bottle of water…. Nope, I’d had enough of being wet and cold. Time to go all the way or at least give it a try. It was 3:05 as I left Lock 26 behind. 20min of hard paddling and I was at Lock 25, waiting to be lowered to the next level. You get a 10min wait as you get lowered down so no sense holding back on the way there, not when the locks are that close. 15min gets me to Lock 24, and another 10min break. 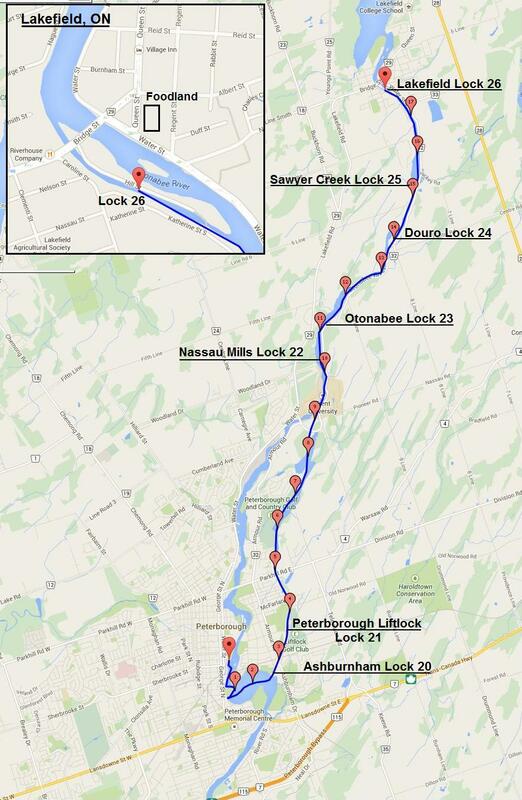 Lock 23 isn’t far away either, but after that it would be 8km to the Lift Lock. 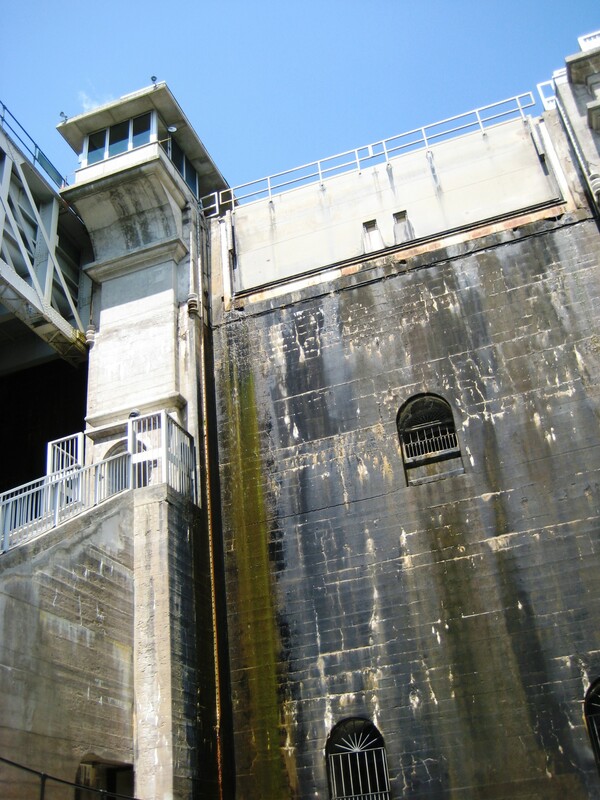 Unfortunately I didn’t get to the Lift lock until just after 6pm, so the lock operator, on his way to his car at the end of his shift, looked sympathetic as he pointed me to the easiest portage route. 1 more portage to go soon thereafter to get past Lock 20 (there’s no lock 21) and I was into Little Lake to face one more stretch into a strong headwind as I made my way across the lake. Wildrock Outfitters was closed by this point, so I’d have to wait another day to return my gear. 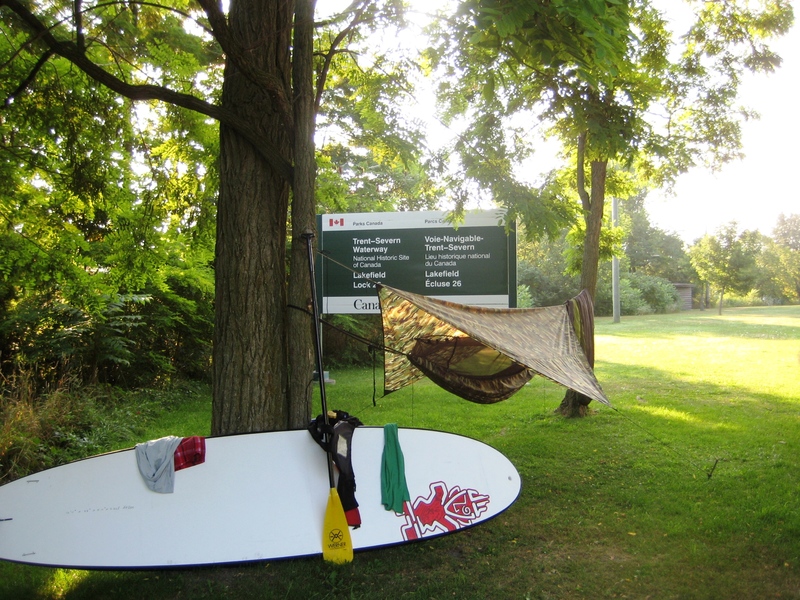 35km after 7 hours and 17min of paddling (including lock time) and I’d arrived back to my put in. Phew! My longest day ever on a SUP! My description of the last couple of days may not make this kind of trip sound like a whole lot of fun. But what’s a nice, warm, sunny day without a cold, wet, windy one to help you appreciate it. It’s all good. The sun wouldn’t peak out from behind the clouds all day, and the wind would not let up. The wind shifted again in the night and my sheltered site was no longer quite so sheltered. 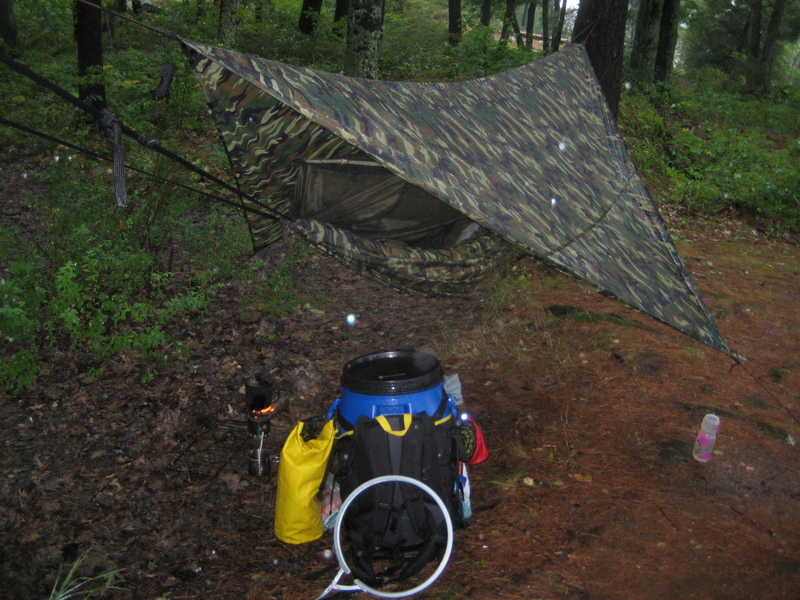 The wind blew straight into camp, coming in from the west at around 30km/h, gusting to 50. I wander around the island a bit, collecting some firewood as the wind finally dries it. I went no where on this day but felt quite at ease about it. I was dry, my stuff was dry and I would warm up by the fire right before bed and call it a day. Perhaps it was just the kind of day that I needed. …and onto the last day of the trip, Day 6. Last night’s storm was brutal! I hang my gear to dry, including my dripping wet sleeping bag and wait until nearly 1pm to get going, with everything still quite wet. Leaving Wolf Island Provincial Park behind, my plan was to return to my island site on Stoney Lake from Day 2 of my trip. 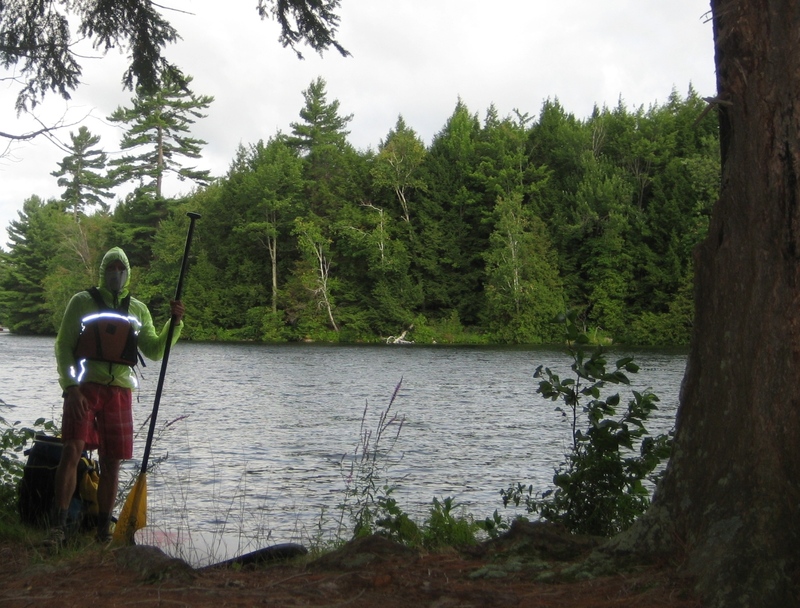 Actually my original plan was to paddle further west, towards Buckhorn, perhaps exploring the lower end of the Mississagua River, but the ‘Severe Thunderstorm Warnings’ thwarted those ambitions and I chose an easier route, 1 that brought me closer to home. Hydro crews had just fixed the 3-phase power interruption as I arrived. Once the opportunity presented itself I sought refuge from the 30km/h headwind by getting out of the main channel and made my way through the Lost Lagoon. I had passed through this way last year and it seemed to take forever. This year it seemed much shorter and more familiar. I paddle right by the hidden logbook of the lost lagoon, since I had signed it a few days ago and had taken the time to enjoy some of the entries left by other paddlers. Back to the island site by 430pm. It’s now beginning to feel like a home away from home and I immediately hang my gear to finish drying in the strong wind, as dark clouds pass quickly overhead, threatening rain once again. I was up at 6 and on the verge of leg cramps. Could have sworn that I’d hydrated well yesterday, but my legs were telling me otherwise. I downed some water, washed up and walked over to Foodland to pick up a few things for my trip. Grabbed a coffee from McD’s on my way back and sat by the water to enjoy it. It was nearly 7am. I had a washroom key to return but the lock operators wouldn’t arrive until 9 so there was no hurry. I packed up slowly and finally handed in my key around 915 before setting off. 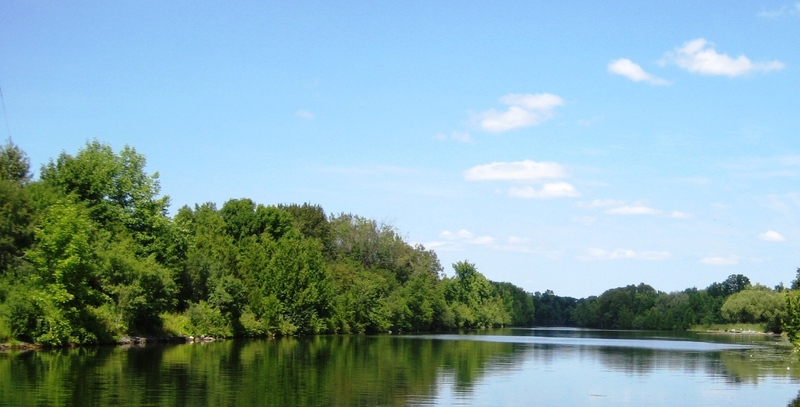 As you put Lakefield behind you, the Otonabee River opens up into Lake Katchewanooka. Only an hour in and I was ready for a break in the shade. I stopped in this exact spot last year…. I downed a full litre of water before I was on my way again, through this weedy section, and back over to the main channel. I arrived in Youngs Point, it was just 1130. I brought my gear ashore and began the short walk over the foot bridge to Granny’s Restaurant for breakfast. The place was packed, but I was seated quickly and a hot cup of coffee arrived soon thereafter. 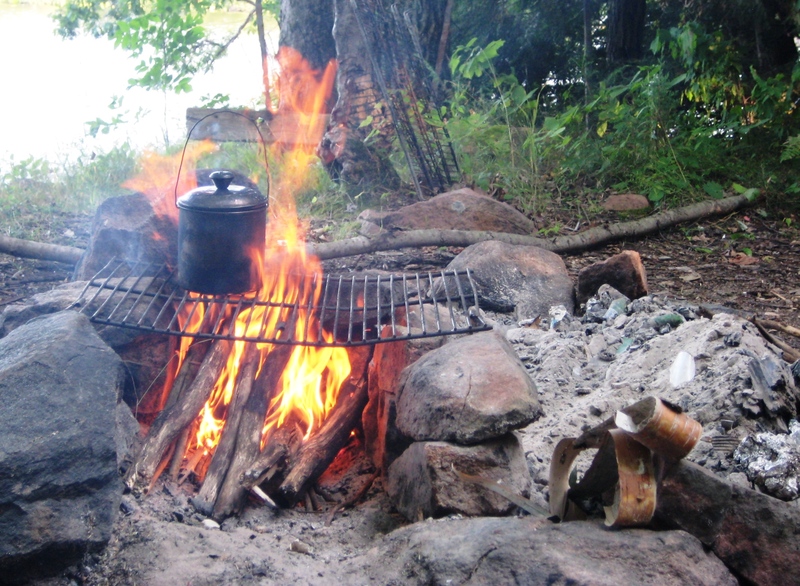 It was nearing noon of the 2nd day of my camping trip and I hadn’t even struck a match yet, this was feeling a little strange… Grandpa’s #2 (uh, that doesn’t sound quite right) breakfast special filled me right up; 3 eggs, 3 sausage, 3 bacon, some home fries and 2pc of gluten-free toast! If you’re not in a huge hurry, and up for the scenic route back, hang a right as you come out of the restaurant, walk 100m, and enter the trail on the left hand side of the road. This will take you to the dam. Cross the dam and you’re back at the lock. While you’re there you might as well take a stroll through Lockside Trading – no visit to Young’s Point is complete without it. It was 1pm before I set off from Young’s Point and headed into Clear Lake. There is a continuous flow of high-speed boat traffic on Clear Lake on this beautiful Sunday afternoon. I look up to see 4 boats abreast coming straight towards me and decide it’s time to cross to the east side of the lake in search of calmer waters. By 2pm I’m at the north-east end of the lake and passing amongst the many islands. I tour the area briefly and arrive at my island camp site by 330. The garbage in the fire pit is still warm. I spend the next 20min clearing the site of broken glass and garbage 😦 The next thing I do is tend to the fire pit. 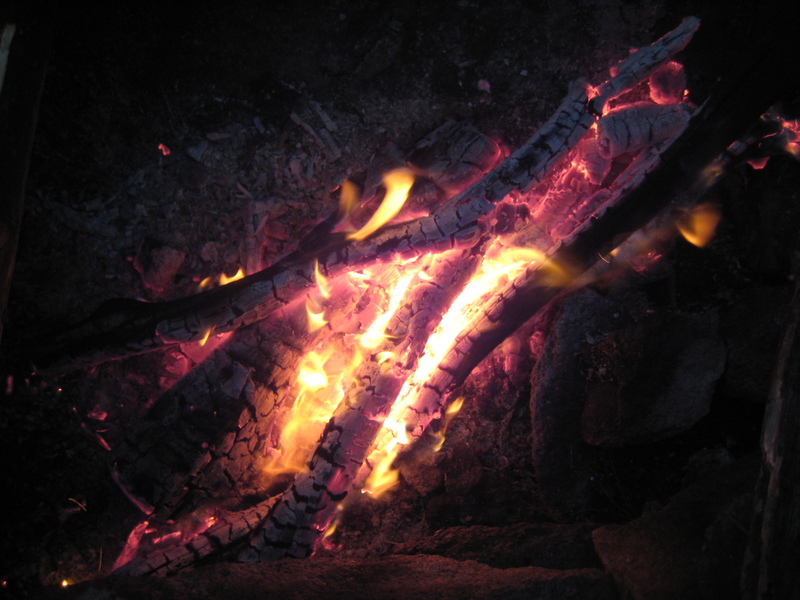 Most fire pits are around 3″ deep and 4 feet across. Not much good for anything but wasting firewood. I cut the firepit into a 1/4 of its original size and build up the sides. This will protect the fire from the wind and reflect the heat where you want it. Cut the fire pit into a quarter of its size and build up the walls. This will protect against wind and reflect the heat where you want it. 530 and my hammock is up and enough firewood gathered to get me by. Not much left to do now and lots of time to do it. I enjoy my dinner, clean up and take a sunset tour on my SUP before settling in by the fire to reflect on a wonderful day. The full moon shines upon me and it’s time for bed, uh, time for hammock? Check out Day 3 of my trip. 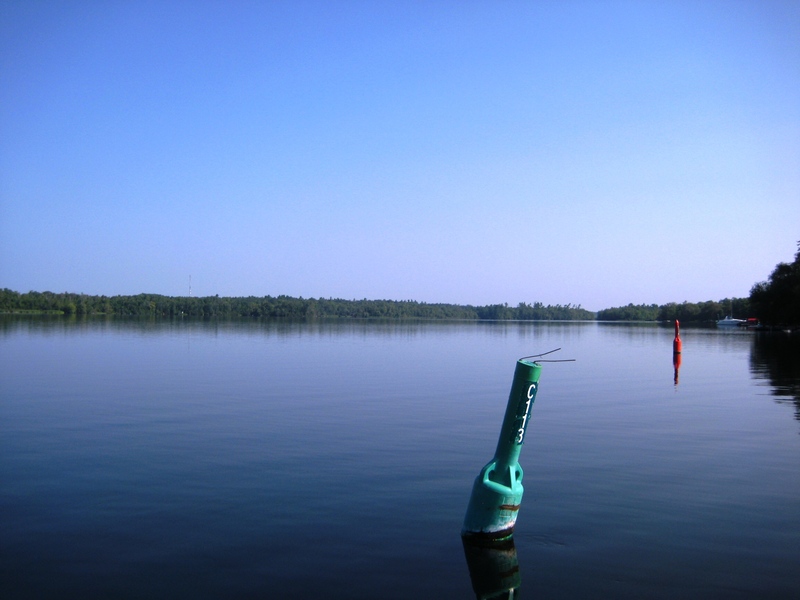 Find yourself in the Peterborough area and fancy getting out on the water? 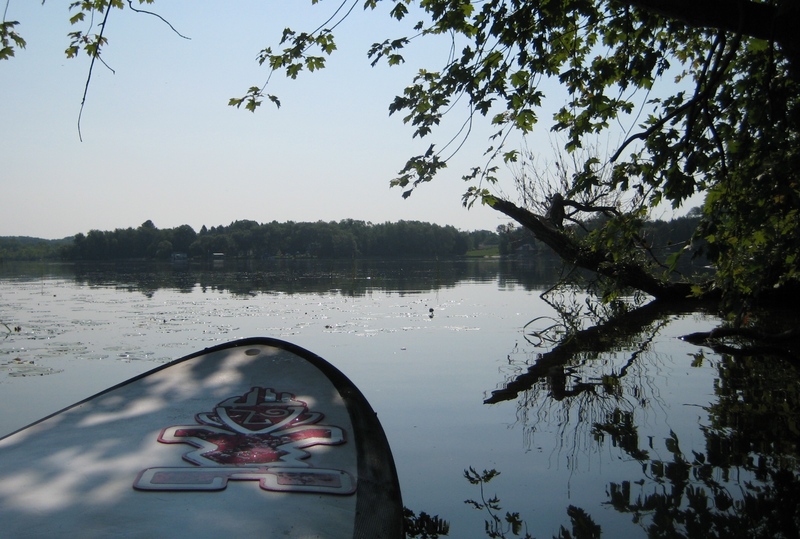 Rent a SUP from Wildrock Outfitters or Peterborough SUP and get out there, both have similar day rates. With something slightly more ambitious than a day of paddling in mind, I carried my rented SUP down to the water and set off on a 6 day SUP camping trip. A fountain rises out of Little Lake, in the heart of Peterborough. 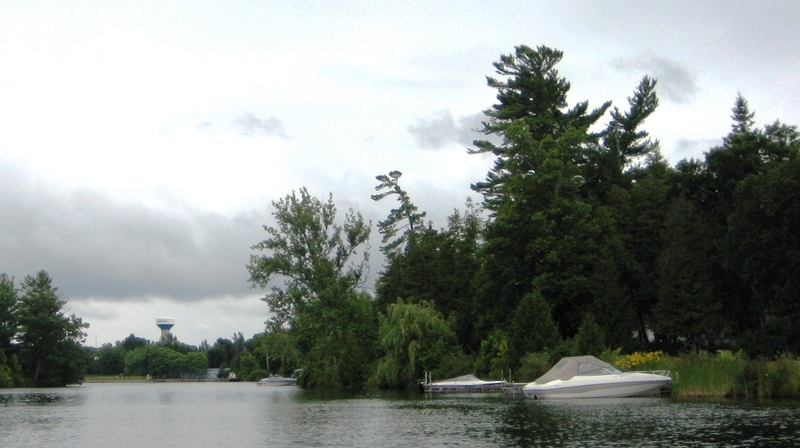 Heading north up the Trent-Severn Waterway offers an interesting mix of urban, rural and wilderness paddling. The waterway is quite undeveloped as you slip quietly through town. It feels immediately like you’re out in the country. Last year I stopped for the night at Lock 24. It’s a beautifully secluded spot. Lock 23 isn’t bad either if you’re looking for options. 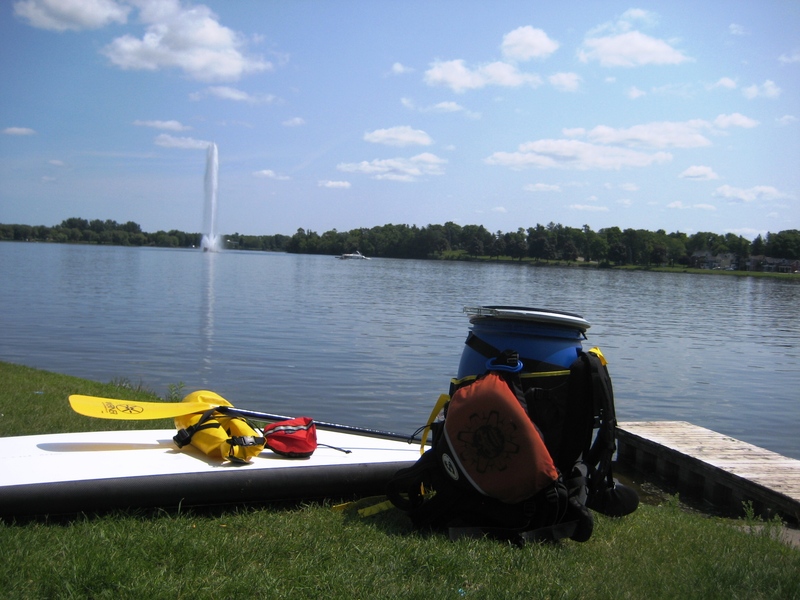 On this day I paddled on to Lakefield’s Lock 26, about 18km upstream from my put-in. 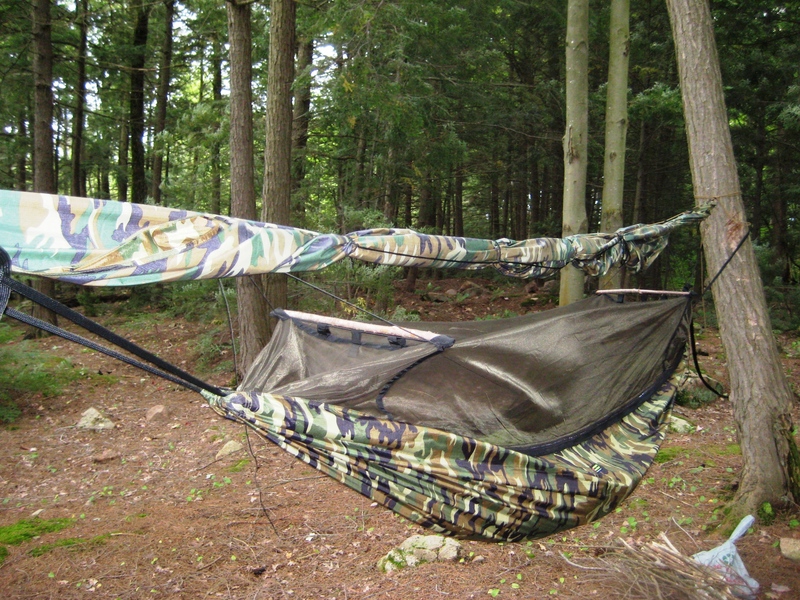 Getting camp setup early, I found two trees appropriately spaced, and hung my hammock, before wandering through town looking for a place to eat. On the map above you’ll find Foodland marked off. This grocer is open 24hrs, so if you want to paddle light on the 1st day, you can pick everything up once you get to Lakefield. Most of the town’s restaurants can be found along Queen street. I stuffed myself with a full rack of ribs at the Thirsty Loon before heading back to “camp”. The 1st day was coming to a close as a full moon rose over head. Dinner in a restaurant, running water, a washroom. 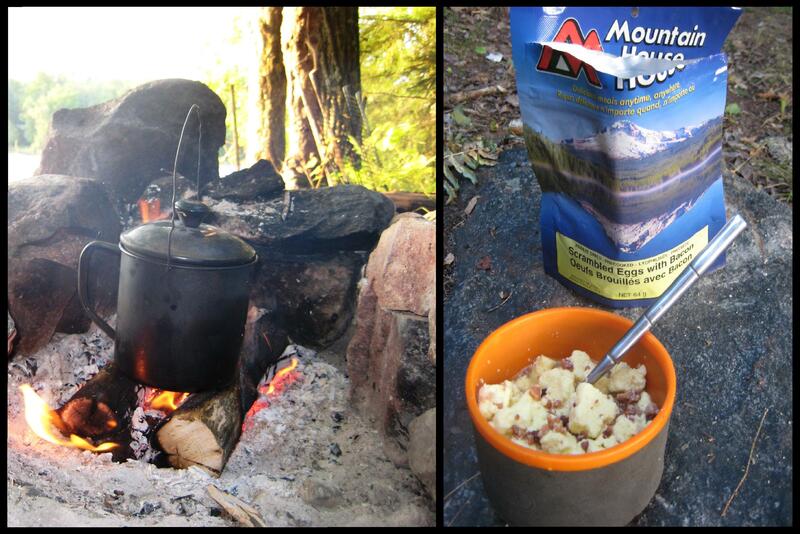 Didn’t feel quite like camping, but my trip was underway…. Check out Day 2 of my trip.